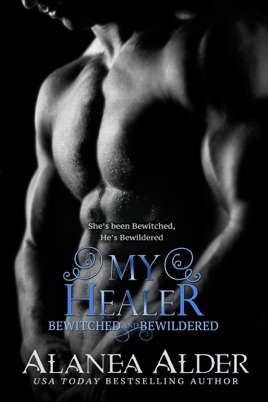 This is the third book in Alanea Alder's Bewitched and Bewildered series and I am itching to pick it up and read it for the 5th time. I absolutely love the new additions to Meryn's ever growing family. The quirky little human is still as extraordinary as ever and Aiden is still a huge teddy bear! I couldn't stop reading once I started and before I realized it I finished the book in a mere couple of hours! For anyone looking to escape reality and go on a crazy adventure I suggest picking up this book series. First of all I would just like to put a warning out there to not eat or drink when reading this book because you will choke from laughing so hard. Alanea Alder outdid herself again. My Healer was a mix of everything you want in a book from humor, love, and sassiness, to action, mystery, and suspense. I laughed and I cried and I want more! You will fall in love with Colton and Rheia and a piece of your heart will be taken by Penny. I have to say that this was my favorite one out of the whole series so far!